There are still some forests unknown to humans. There was the one of the Dent Creuse (where a certain Oscar is present), there is now the one of Fantasy, even smaller and more secret. There is a noisy band of magical creatures. Leprechauns, elves, korrigans and other dryads, and even fairies all puny or bearded gnomes. Everyone could live in their own corner, going about their business, their own little goblin routine. Yet, we don't know what the creatures have bitten, but they decide to do as humans do and choose a leader. After a lot of bickering, we decide to come around a big table so that everyone has a chance to attract votes. Then begins the most formidable magical crash that the Earth has ever carried! 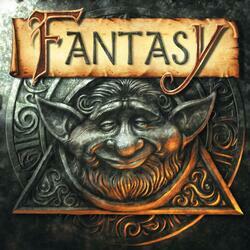 Fantasy is a quick and simple little card game (which won't stop it from testing your tactical sense and memory!). Each player has 5 cards in hand belonging to one of the eight peoples of the game. Each of these maps represents one of the different creatures that inhabit the forest and each people has a unique power. The goal of the game is to have as many cards as possible in front of you at the end of the game. To do this, every time it is your turn, you play one of the cards you have in your hand by putting it in front of you and applying its power. Depending on the turns, you will be able to steal cards from your opponents (the ones they took from you? ), return cards already placed in your hand, exchange cards, etc. It's up to you to keep your cards for the right time and hide your game well. If your people grow too fast, you may well become the target of jealous opponents! Contents of the box : 1 rule of the game, 55 cards showing the inhabitants of the forest.